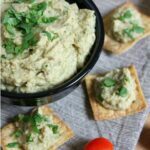 This 6 ingredient hummus is absolutely delicious and super easy to make! Peel eggplant & cut into thick slices. Sprinkle both sides heavily with salt, then let sit for 15-30 minutes. Preheat oven to 400 degrees. Rinse salt off eggplant slices & pat dry. Then place on foil-lined cookie sheet, brush with olive oil, & sprinkle lightly with salt and pepper. Roast for 30 minutes. Let cool slightly. Place chickpeas in food processor. Add garlic, parsley, salt, pepper, & lemon juice, then pulse until blended. Just a few seconds. Add roasted eggplant and pulse again until blended, just a few seconds more. While food processor is running, slowly add olive oil in a steady stream & mix until blended. Transfer to dish and let chill for 4 hours or overnight, until flavors are blended. Serve with pita or tortilla chips and some fresh veggies.